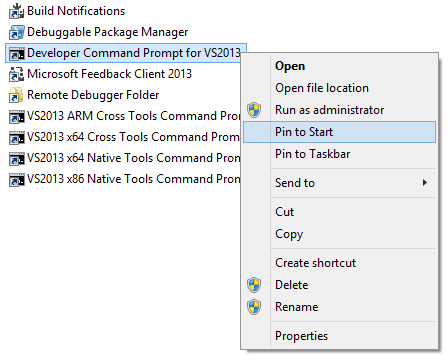 I can’t find the Visual Studio 2013 Developer Command Prompt! Press the Windows key and type "Visual Studio" on the Start screen, and then select "Visual Studio Tools". This will open a File Explorer that contains the command prompt. Do yourself a favor and right click the item and select "Pin to Start" so you never have to search for it again!